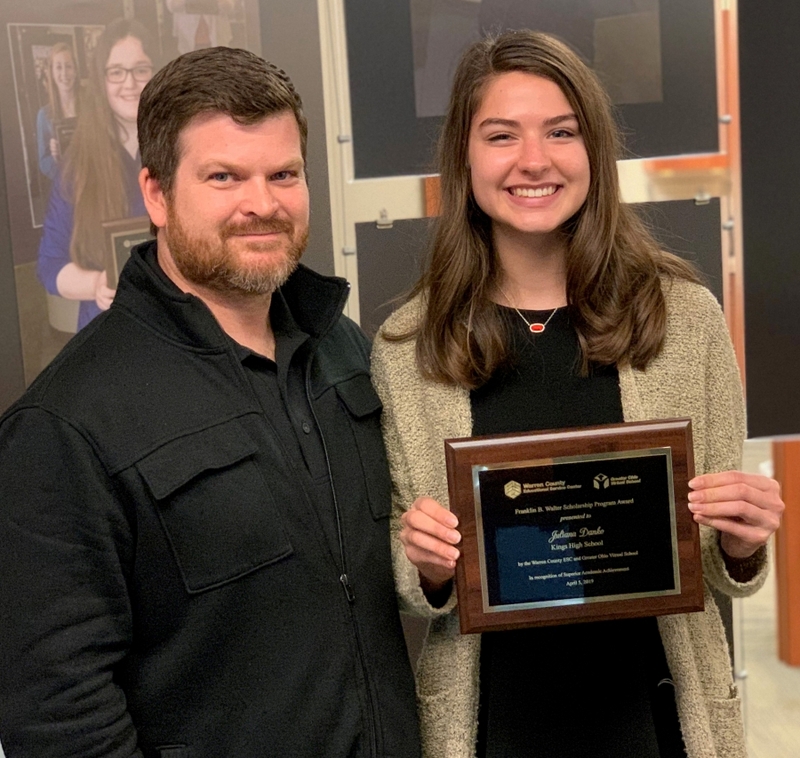 Kings High School Senior, Juliana Danko was presented with the fourth annual Franklin B. Walter Scholarship from the Warren County Educational Service Center on Friday, April 5, 2019. One student from each Warren County school district received the award at a luncheon given in their honor. The award honors students who have exhibited superior academic achievement and recognizes the teachers those students have chosen as having a positive impact in their lives. Selection of the award was made by school district leaders in each Warren County school district based on applications submitted by students. Dr. Franklin B. Walter was the State of Ohio Superintendent of Public Instruction for fourteen years. This award was created by the Ohio Educational Service Center Association to honor Dr. Walter’s significant and lasting impact on public education in Ohio. Juliana was asked to write a letter to recognize one teacher that has had a significant impact on her life. She chose her teacher, Jason Shields. At the awards luncheon, Juliana read the letter she wrote about Mr. Shields. Juliana currently has a 4.59 GPA with a strong record of AP, Honors, and CCP courses. She will graduate with honors as well as with the Seal of Biliteracy in Spanish. Juliana uses this second language in real life having spent more than 500 hours in Monterrey, Mexico serving children through Back2Back Ministries. Since her first trip, she has taken a leadership role in organizing Kings students to serve. In fact, she so believes that this work is transformative, that she worked to create a scholarship for a classmate who would not have otherwise had the opportunity to share this experience. Dance has also been a passion much of her life and has lead Juliana to use her years of training as a performer in Kings and Royal Theater of Mason musicals. In addition to school and theater, she’s on the leadership team for her church youth group, worked on the Green Power Car with the Kings Engineering Program and is a member of the National Honor Society and Spanish National Honor Society. To save money for college, Juliana teaches dance and sports skills classes at the Kids Academy at Lifetime Fitness. In the fall, Juliana will attend Ohio State University and study Industrial and Systems Engineering. She is the daughter of Don and Kim Danko. The Governing Board of Warren County Educational Service Center awarded Juliana $500. Kings Local Schools is extremely proud of Juliana and her accomplishments!